Steven (Chicagoland, United States) on 25 September 2014 in Architecture and Portfolio. The Harry Adams residence was the last house designed by Frank Lloyd Wright in Oak Park, completed in 1913. 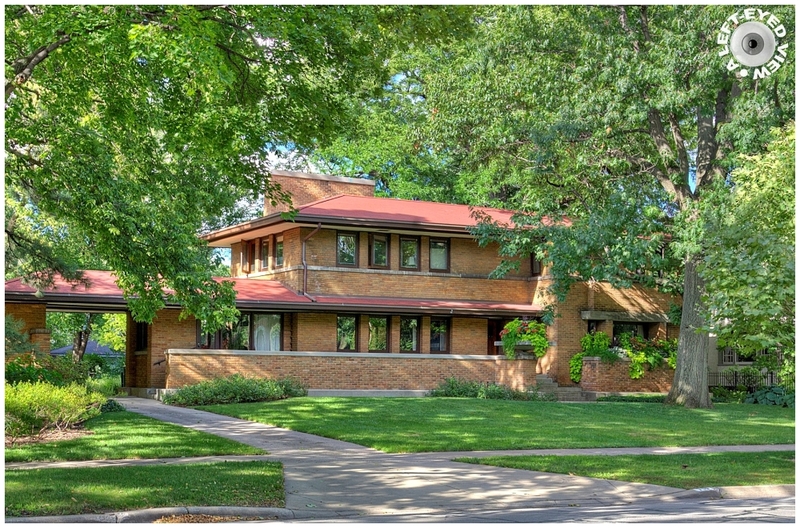 It is a pristine example of a fully mature Prairie Style house to cap Frank Lloyd Wright's Oak Park period. Originally, when the Adams' contacted Frank Lloyd Wright to build them a home, the design he came up with was far out of their budget. They subsequently contacted a different architect to build them a Wright-like home -this too was still out of their budget. They went back to Wright who reluctantly agreed to scale down the home to fit within their budget. The Harry Adams House has a very low hipped, almost flat roof; a broad central chimney; it rests on a concrete stylobate; and it maintains a long, flat, horizontal appearance. One of the scale backs of the Harry Adams House included using only art glass windows on the top floor. Additionally, the Harry Adams House is the only Frank Lloyd Wright House in Oak Park that has a carport. Fantastic presentation of the old home. Love the series. A beautiful house in a fine setting. I liked knowing it was FLW last house. thanks to your documentation, it's possible to see the likeness but also the distinguishing features of wright's buildings! oak park must be a heaven for aficionados of the man !!! A great looking "budget" house that's still beautiful today. An excellent capture. At the risk of repeating myself, this is a wonderful series. The appearance of the house surrounded by the trees is splendid. Great image. A residence in a beautiful park !! Very beautiful composition and sera colors and light . So nice. Reminds me a lot of the neighborhood, with trees, bricks, that I grew up in in the 1950's in Arlington Heights, near Chicago. @LauraS: While it has grown by leaps and bounds, Arlington Heights still remains a beautiful place. Stunning composition! thanks to your documentation Steven! This is beautiful, Steven ... the trees loving envelope the house. Your HDR treatment is superb! Nice architectural shot. The dappled sunlight is particularly attractive. with beautiful composition, colors, lighting & shadows! I like the way the light and shadow compete for space on the building. Nice shot. His work had really stood the test of time. J'aime beaucoup ce cadre de verdure où se niche cette magnifique demeure. Une très belle scène ! Amicalement.. Thanks for comment above, Steven. I have NOT been back to Arlington Heights since 1960. We lived there from 1952-1956. Then we moved to CA. I remember when at the end of our block was a cornfield, and a grove of trees across from the field of corn. It was like the country to me. We lived at 1008 North Dunton Street. I still remember learning that address. Your exposure and processing really enhances the natural beauty in this series.